In a study published in the Aug. 25 issue of the journal Science, researchers describe "twistron" yarns and their possible applications, such as harvesting energy from the motion of ocean waves or from temperature fluctuations. When sewn into a shirt, these yarns served as a self-powered breathing monitor. "The easiest way to think of twistron harvesters is, you have a piece of yarn, you stretch it, and out comes electricity," said Dr. Carter Haines, associate research professor in the Alan G. MacDiarmid NanoTech Institute at UT Dallas and co-lead author of the article. The article also includes researchers from South Korea, Virginia Tech, Wright-Patterson Air Force Base and China. "Fundamentally, these yarns are supercapacitors," said Dr. Na Li, a research scientist at the NanoTech Institute and co-lead author of the study. "In a normal capacitor, you use energy — like from a battery — to add charges to the capacitor. But in our case, when you insert the carbon nanotube yarn into an electrolyte bath, the yarns are charged by the electrolyte itself. No external battery, or voltage, is needed." 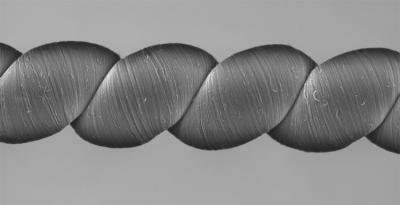 Stretching the coiled twistron yarns 30 times a second generated 250 watts per kilogram of peak electrical power when normalized to the harvester's weight, said Dr. Ray Baughman, director of the NanoTech Institute and a corresponding author of the study. "Although numerous alternative harvesters have been investigated for many decades, no other reported harvester provides such high electrical power or energy output per cycle as ours for stretching rates between a few cycles per second and 600 cycles per second." "There is a lot of interest in using waste energy to power the Internet of Things, such as arrays of distributed sensors," Li said. "Twistron technology might be exploited for such applications where changing batteries is impractical." "Electronic textiles are of major commercial interest, but how are you going to power them?" Baughman said. "Harvesting electrical energy from human motion is one strategy for eliminating the need for batteries. Our yarns produced over a hundred times higher electrical power per weight when stretched compared to other weavable fibers reported in the literature." "In the lab we showed that our energy harvesters worked using a solution of table salt as the electrolyte," said Baughman, who holds the Robert A. Welch Distinguished Chair in Chemistry in the School of Natural Sciences and Mathematics. "But we wanted to show that they would also work in ocean water, which is chemically more complex." "If our twistron harvesters could be made less expensively, they might ultimately be able to harvest the enormous amount of energy available from ocean waves," Baughman said. "However, at present these harvesters are most suitable for powering sensors and sensor communications. Based on demonstrated average power output, just 31 milligrams of carbon nanotube yarn harvester could provide the electrical energy needed to transmit a 2-kilobyte packet of data over a 100-meter radius every 10 seconds for the Internet of Things." Researchers from the UT Dallas Erik Jonsson School of Engineering and Computer Science and Lintec of America's Nano-Science & Technology Center also participated in the study. In the U.S. the research was funded by the Air Force, the Air Force Office of Scientific Research, NASA, the Office of Naval Research and the Robert A. Welch Foundation. In Korea, the research was supported by the Korea-U.S. Air Force Cooperation Program and the Creative Research Initiative Center for Self-powered Actuation of the National Research Foundation and the Ministry of Science.